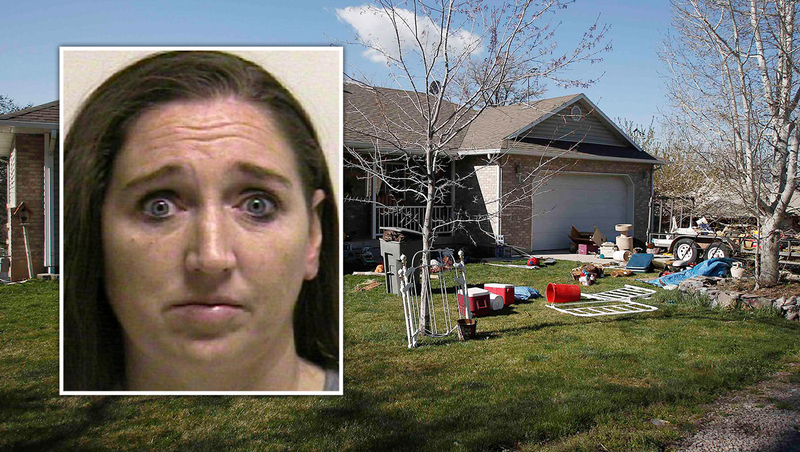 PROVO, Utah - Authorities say a Utah woman accused of killing six babies that she gave birth to over 10 years told investigators that she either strangled or suffocated the children and then put them inside boxes in her garage. The police statement says she admitted she killed them immediately after they were born, and put their bodies inside boxes. The statement said each baby was wrapped in either a towel or a shirt, and placed in a plastic bag. In Provo Monday, State Judge Steven Hansen set bail at $6 million -- $1 million for each child Huntsman is accused of killing. Huntsman appeared via video in a Utah courtroom Monday morning. She was unresponsive during the hearing, reports CBS affiliate KUTV. Huntsman, 39, was arrested Sunday on six counts of murder after police found the infants' bodies in cardboard boxes in the garage of her former home in Pleasant Grove, about 35 miles south of Salt Lake City. A seventh baby found appears to have been stillborn, Utah County Attorney Jeffrey Buhman told reporters after Monday's hearing. Formal charges have not yet been filed against Huntsman and no other arrests have been made but Buhman said the investigation remains open. Investigators on Monday were still trying to determine if the seven babies had the same father, Buhman said. The gruesome case has raised a series of questions about how the killings occurred despite Huntsman living what neighbors said seemed like a normal existence. Neighbors told KUTV that she was a good neighbor and cared for other neighborhood children. "She's lived here for about 15 years and was a good neighbor, as far as we knew," next-door neighbor Kathie Hawker told the station. They also said they never knew she was pregnant, though they said she sometimes wore baggy clothing. Police declined to comment on a motive and on what Huntsman said during an interview with investigators. Her estranged husband found the first infant's body while cleaning out the garage after recently getting out of prison. The ex-husband and some family members had been cleaning out the garage when "they came across a suspicious package that had kind of a pungent odor," Pleasant Grove Police Chief Michael Roberts told KUTV. "They began to open up the package and they found a deceased infant inside the package and called us to respond." Responding officers then found the six other bodies, Roberts said. Authorities do not believe the estranged husband was aware of the killings and say he isn't a person of interest in the case at this time. Family and neighbors identified him as Darren West. West pleaded guilty in federal court in 2005 to two counts of possessing chemicals intended to be used in manufacturing methamphetamine, court records show. In August 2006, he was sentenced to 9 years in prison, but appealed the term three times. He maintained his innocence and said he never had any intention to manufacture meth. Roberts said police believe West and Huntsman were a couple when the babies were born. "We don't believe he had any knowledge of the situation," Roberts told The Associated Press. Asked how West could not have known about it, Roberts replied, "That's the million-dollar question. Amazing." The babies' bodies were sent to the Utah medical examiner's office for tests, including one to determine the cause of death. DNA samples taken from the suspect and her husband will determine definitively whether the two are the parents, as investigators believe. Huntsman also has three daughters - one teenager and two young adults - who lived at the house. Late Sunday, West's family issued a statement saying they were in a "state of shock and confusion." "We are mourning this tragic loss of life and we are trying to stay strong and help each other through this awful event," the statement said before asking for privacy.